It is a temporary open space for all ages, where they can stay and spend time together in their own ways. 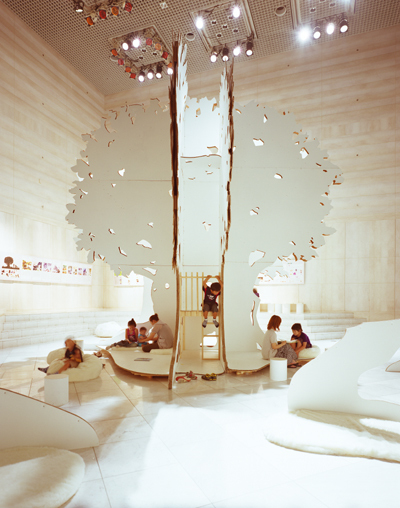 “A white big tree” stands silently in the center, and “crooked trunks” and “soft fruit cushions” are placed around it. Children play in and out of tunnel and climb into a tree house. Lovers sit together on a fruit and read together. Mother and baby lie under the tree and relax. And an elderly couple is observing the whole scene from the cafe. Although they are all perfect strangers, “the big tree” unites all people and activities, and provides calm and comfortable landscape and beautiful memories of summer vacation.